Less spent on utilities: Your smaller home needs less fuel for heat, and uses less electricity. 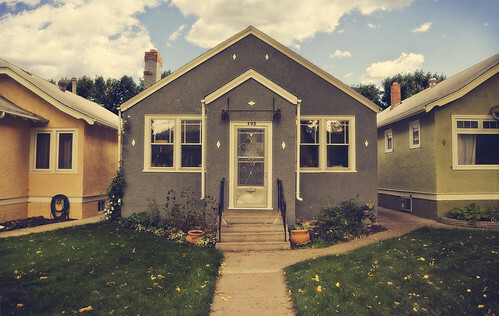 If you are especially careful about your energy use, a small home can mean huge savings over a large home. Lower property taxes: Unless your small home is sitting on a huge and valuable piece of land, you are likely to pay lower property taxes than if you had a large house. Smaller property = lower taxes. Buy less: If you don’t have space to put stuff, you are less likely to buy it. Downsizing, for some, provides an excuse to get rid of the clutter that has accumulated over the years. And, once you have your small house, it can be an incentive to buy less to prevent the clutter from creeping back. Of course, a small home means that you might not be able to entertain guests at your house, so you might have to go out more if your social life is important to you — and that could cost you. Can You Save with a Large Home? No need to pay for storage: If you aren’t willing to part with some of your stuff, you would need to pay for storage with a small home. When you have a larger home, though, there is ample room for your things — and no need to feel surrounded by clutter. Frugal entertaining: Rather than going out, you can stay at home and entertain on a frugal budget. The same is true of family activities. A family might feel cramped in a small home, and look for ways to go out (and spend money on activities). A larger home allows for privacy, as well as comfort. Increased comfort might encourage more evenings in, rather than a desire to go out. What about your home office? : If you work from home, a larger home that provides you with adequate workspace can be a money-saver. A smaller home may not have the space you need, and you might have to lease office space outside the home. A larger home means you save money on the lease, on the commute and in other areas. Naturally, you want a home that fits your needs and your pocketbook. If you are ready to buy a home, consider the items that are most likely to be of importance to you. Many people are surprised to learn that my family of three resides in a four-bedroom home. After all, if my husband and I share a room, and my son has a room, there are two extra bedrooms. But one is used for my home office, and one is reserved for guests. We often have people stay with us — or even live with us for weeks at a time. For us, a 1,700 square-foot home with four smallish bedrooms and larger common areas is what works. We have a home that is not too big, and not too small. It fits our ideas of comfort, while not being too costly (we spend about 20% of our monthly income on housing). What do you think? What do you look for in a home? If you don’t have too much stuff you can still easily fit all your belongings in a small home. Depending on your passions in life you might still need a garage (or a drive way) to park a car or camper. I’m house hunting right now and would just love a place with an unfinished basement for storage and to build a permanent home brew set up.